Gallons of beer. Never-ending beef. No utensils. In Up in the Old Hotel, Joseph Mitchell describes the Beefsteak as “a form of gluttony as stylized and regional as the riverbank fish fry, the hot-rock clambake, or the Texas barbecue.” These all-you-can-eat, no-utensils, men-only, beer-and-beef-fueled feasts were once common in New York City, where they would be thrown by politicians to attract votes or fire departments to raise funds. But then Prohibition hit, and the bacchanals died out. Now a few chefs are bringing back the tradition (minus the gender discrimination, thankfully). Chief among them is Waldy Malouf of the Culinary Institute of America in New York’s Hyde Park, which will hold its third annual Beefsteak on February 6. A typical 19th-century Beefsteak menu consisted of beer, sliders, beef and bread. Malouf’s is a touch more complex. Prepared by CIA students, the meal starts with baguettes, crudités and huge hunks of New York State cheddar. There are ladies dressed as flappers handing out beer mugs (which servers aim to keep filled at all times), American classics like “Yankee Doodle Dandy” (courtesy of a live brass band), and no utensils in sight (“we do allow silverware, but we look down on it,” Malouf says). Then there's a seafood program: roasted oysters, shrimp cocktail and jumbo lump crabmeat salad with Russian dressing. This second course primes diners for the meaty main attraction, which starts with miniature burgers, served with homemade ketchup and bread and butter pickles, grilled lamb chops and bacon-wrapped lamb kidneys. Before the entrée, Malouf leads the dining room in a rendition of “God Bless America,” then comes the parade of roasted sirloins, which servers carve and top with blood-and-butter gravy (pan drippings, stock, butter and Worcestershire sauce). As if that’s not enough, Malouf throws some whiskey into the mix. Every table gets a bottle of bourbon with glasses and a bucket of ice. “Then more singing ensues,” he says. If you want to get in on this year's epic CIA Beefsteak, all-inclusive tickets are $150 and on sale now. And if you can't get there, you can still throw your own version at home (though you might have to pare it down a bit). 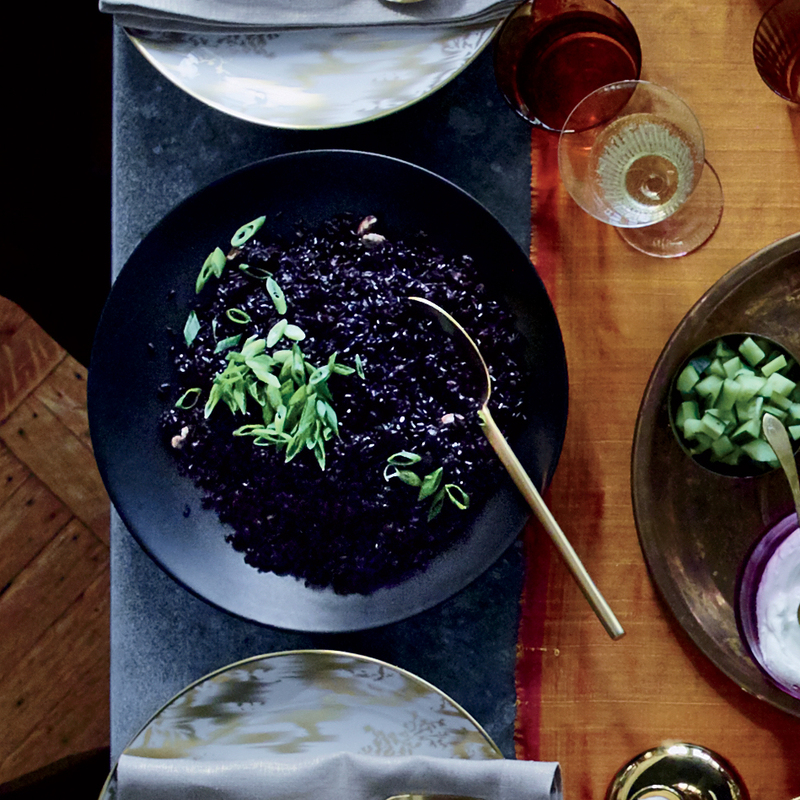 Here, Malouf’s top tips for hosting the greatest dinner party of all time. Invite a crowd. “The more people the better,” Malouf says. “Just to give it that sense of camaraderie.” The CIA is expecting 280 people this year, but you don’t have to go that far. A guest list of eight to ten people is a good start. Set the scene. If you really want to go all out, hire a brass band. But a good Pandora station will also do nicely. “Set the tables rustically with brown paper, provide deli-style paper hats, aprons (that’s your napkin) and supply sharpies for people to doodle,” Malouf says. “It gets fun when people get more lubricated. I’ve known people to frame their aprons.” And, of course, leave the utensils in the drawer. Keep the sides simple. The feast is all about the beer and beef, so keep the sides to a minimum. Malouf likes to serve some sort of potato like a thick-cut cottage fry or mustard-crusted potato wedge. “Just don’t serve scalloped or mashed potatoes,” Malouf says. Bring on the beef. “Beef is required,” Malouf says. 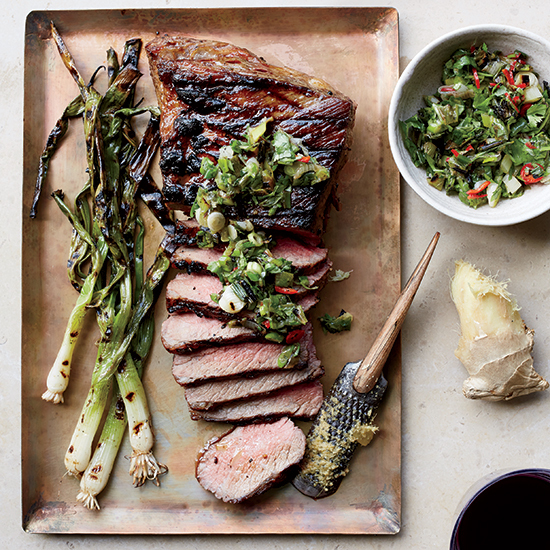 “Choose a cut you can a roast—like a sirloin. You want something that will be tender when it’s rare.” The beef should be extremely well seasoned, and carved and served right at the table. 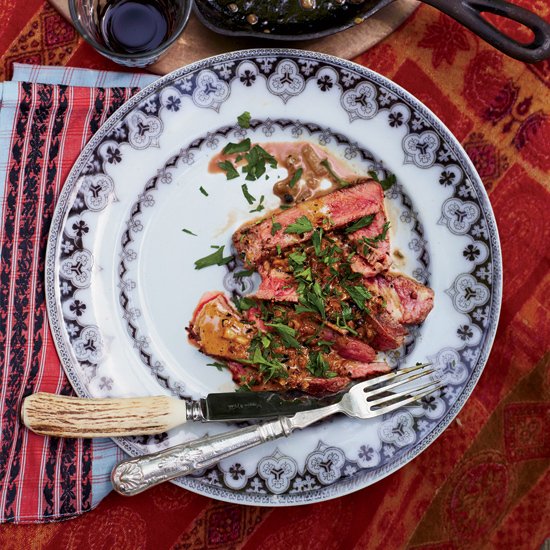 Provide guests with a simple sauce, like an au jus with butter, black pepper and Worcestershire sauce.